Also shown as Unnamed Cemetery 19 off Stembridge Rd / Dickens Pond Rd. From the Hancock County Courthouse, go northwest on Hwy 16 for 6.8 miles to Hunt's Chapel Rd on the left. Turn left on Hunt's Chapel and go 0.7 mile to a stop sign. Turn right onto Dickens Pond Rd, and go 1 mile to Stembridge Rd on the right. Turn right on Stembridge and go less than 0.1 mile to a logging road on the right. Walk down the logging road for 0.6 mile. 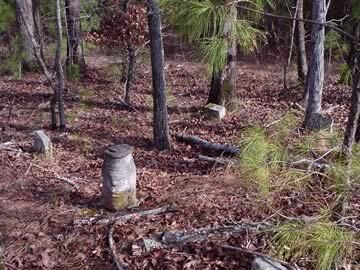 The cemetery will be on the left in the woods next to the logging road. This cemetery is named because local residents believe the headstones and footstones are placed such that the graves appear to be very tall. However, it is more likely that the stones are for different persons. Approximately 20-25 graves marked by stones or visible as depressions.